A stress buster environment for a pet is the best gift by their parents. Cats are very sophisticated and healthy pets. They like staying fit and groomed, so they look the best every time. They are very comfortable pets when once set in a surrounding and hate changes. Changes of any sort like moving to another house, taking trips, season changes, holiday season arrival, guests coming to visit etc., cats become anxious and stressed in such environment. Felines are not at all ferocious creatures. In fact, they are cute little ball of fur who loves to climb up and down trees and wooden builds. They are fond of little stuffed toys and play around with them. Moreover, when they are tired they laze around for hours (sleep lovers). So, whenever you are feeling even a teensy bit of a hint that they might be under stress or becoming anxious, leave them in a room full of her favorite toys. Build tree like structures in the room where the cat can play and spend her day. A few puzzles with a giveaway treats will spice up their day indeed. And, by the time you come home from work, you won’t find even 1% of sign that your cat has had a rise in her anxiety levels. Everyone loves a cool, low tuned and sweet music. It is a sweet heaven to the ears. 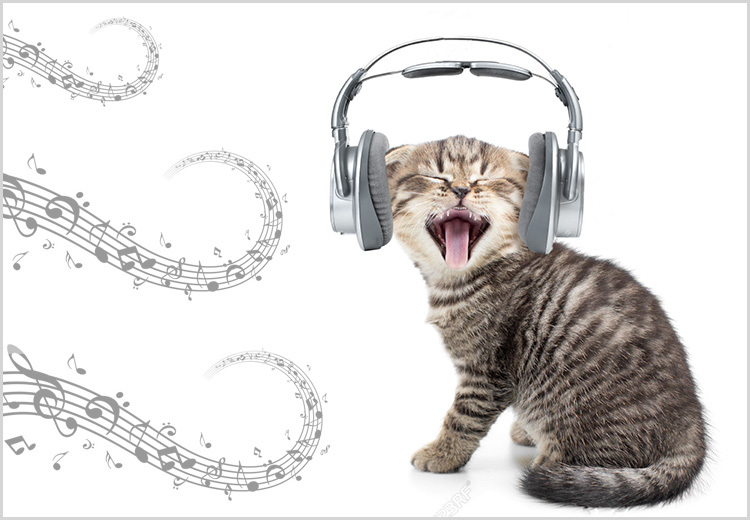 Make your cat used to listening to such sounds so she doesn’t get frightened on hearing anything unusual. Generally, during the holiday season when crackers are burnt or fireworks takes place, cats are the first one to meow angrily and hide under a sofa or table. Getting used to the sound of a telly or listening to music may help her in such situations. Research studies have shown that harp music works as a therapy for cats, reduces the level of destructive behavior, and keeps them happy and healthy. Various cat-calming products have been introduced in the market that has shown effective results. One such efficient working spray is Feliway Spray for Cats. A fast acting and easy to use spray bottle quickly sets off the pheromones and calms down the kitty. It is an excellent stress-reliever and helps the kitty copes up in new environment without displaying any sign of anxiety or distressful behavior. Herbs are a nature’s way of giving you answer to your problems. Herbal therapy includes using certain useful herbs that may help in calming your feline friend down. Stress reducing and lessening the anxious behavior of a cat includes the use of following herbs – Catnip, Valerian, Chamomile etc. Cat massage is actually a real thing. Therapeutic Touch massage of a cat is a process of circular movements on the body that calms the cat down with the proper pressure applied. Acupuncture is also done on cats to soothe her down and relax the cat. Make moving in/out of the house stress-less by making the cat comfortable with a crate. Stuff toys, bedding, pillows and her favorites in the crate so she’ll play and pass her time without feeling angry or hesitated or stressed. These things will also help in a car travel journey. Consult a vet regarding the diet you should feed to your kitty when she is stressed to lighten up her mood. Food has always to do with your feline’s health so a slight change in diet might also help your kitty to relax and enjoy the meal. Cat loves to be adored, played with, and pampered in all ways. They love to stay beautiful and even self-groom themselves. So avoid making them angry in all situations and provide a joyous and a stress free life to them.